I just bought a center deck G3 today. 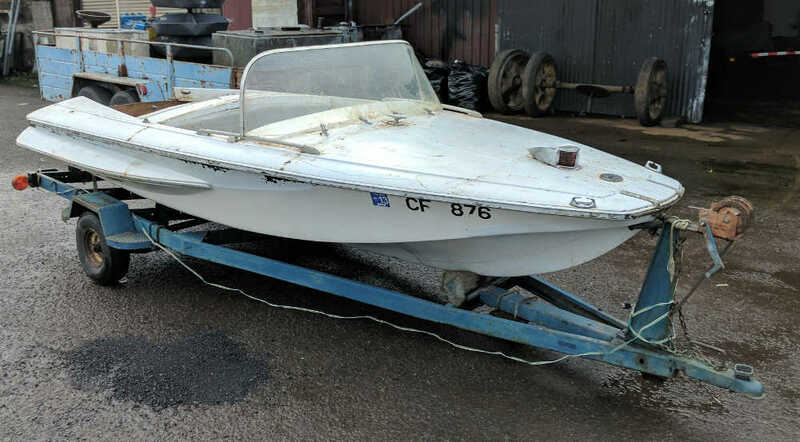 It came with a trailer and an Evinrude 35HP. The bought has been neglected, left outside and is dirty. Where should I look for damage? I'll upload photos soon. Welcome to the website Sir and congratulations on getting your G-3! They are great boats! To answer your questions, the first place to check is the transom and the floor. If your boat is a center deck, you will have the wood stringers so if the floor is rotted then the stringers are usually bad as well. I have a 1960 G-3 (center deck) which has been in our family since the day it was bought new by my Dad. I will post a link to that for you so you can read about our "refurbish." Good luck with your project Chris! Hopefully, this should help you some. Thanks! I am reading through the restoration of your boat. ! 'll have photos of mine tomorrow. You are very welcome Sir! I hope the link is able to help you with your G-3. I know that I had alot of help and advice from fellow Glasspar Owners when we did the "refurbish" of our G-3. Looking forward to seeing your G-3 pictures! Here is that ad that I saw with the boat for sale. And here is a picture of it in front of my shop. Chris, it looks like you have a pretty nice G-3 there. 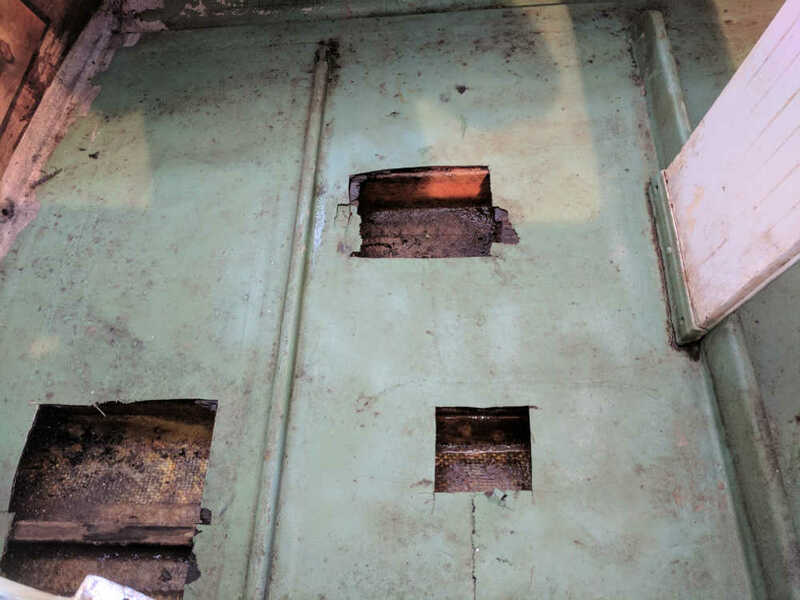 Have you had a chance to check the transom or floor condition yet? 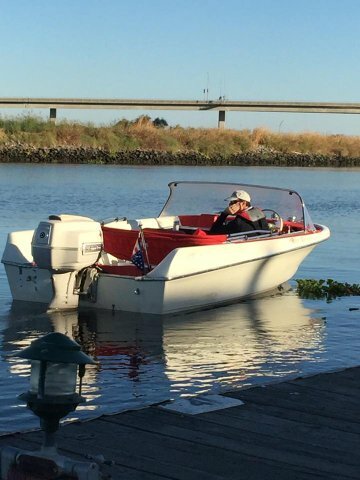 Also, what size Johnson Outboard was on that boat? I couldn't tell from the pictures. When my Dad first purchased our 1960 G-3 he had it set-up with a 1960 Johnson 40 H.P. Outboard, but about a year later traded that in for a 1960 Johnson 75 H.P. which helped my older Brother be able to get up on skis as he was very tall. That 1960 Johnson 75 was on our G-3 for almost 20 years before my Dad replaced it. Very nice sir!! Now, after restoring it, you will need to have more hp (60-75 hp) on the G-3! 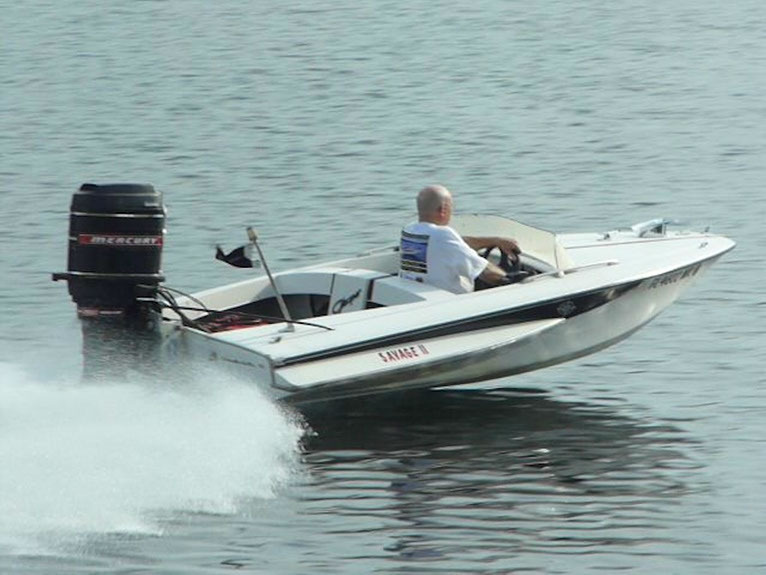 It was a go-fast ski boat when new and it can't go fast with a 35 hp engine! Here is mine with a 1969 100 hp Merc! 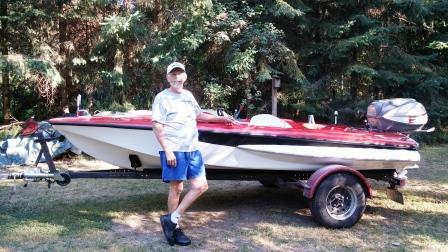 I raced boats for 20 years including a 1960 G-3 I bought new in 1960 with a 75-hp engine!! Enjoy and keep us posted on its progress!! My first one with 75 Johnson and the one I have now with the 1000 Merc "tower of power (1969)"
You don't need 100 hp, as it is a bit scary, but 60 to 75 hp works great on the G-3!! Good to see you are still kicking too JP!!! Chris I have a 1966 Johnson 100HP Golden Meteor for sale that runs beautifully. I have tach gauge, control box, a couple of props, and lots of extra parts. I got it running last year after it had been sitting for 7 and it hasn't let me down at all. I'm just in the process of repowering. It is located in Sacramento. Private Message me if you would be interested. Price is negotiable. I would rather it go to a good home. The floor has a few areas that had rotted through. I removed the rot in these areas and the stringers seem like they might be ok.
At the edges where I cut the holes in the floor, the plywood feels good. If I cut these areas out larger to the midpoint of the nearby stringers, would patching the floor be acceptable? Actually, you probably have a 15" transom and my motor is a 20". You would have to build it up 5" to support the motor. Also, I read the Craigslist ad. Make sure you can get it registered before you spend too much time and money on it. California likes titles for both trailers and boats. A bill of sale won't cut it. At least, it didn't with my situation. Welcome to the hobby! And just know that at times it will be frustrating, but in the end, the fun on the water and all the friendly discussions you have will outweigh any of the negative. As a newbie here was my priority formula. 3. Visual (Make it look nice) I'm on step 3 now, but I had a lot of fun with it last year. Nice job on the web-site. IMHO,...An I am not fiberglass expert to say the least,...You should look very closely at the wood in the stringers, because - unless they have been replaced in the last 10-15 years, they are probably rotten. The stringers in the G-3 are extremely important to the structural integrity of the hull. 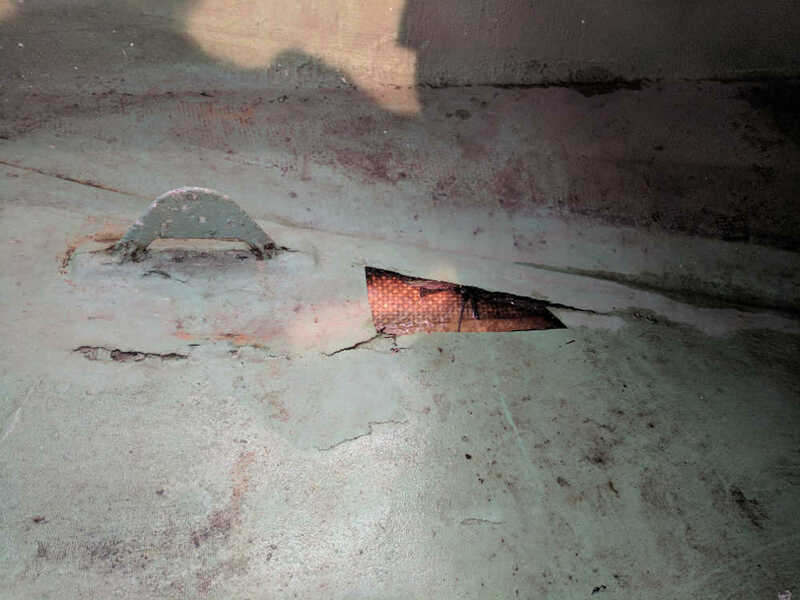 If they are weak (rotten, etc) the hull will flex around and not only allow your bottom to get out of shape, it can present a high risk of allowing the layers of glass in the hull to separate causing an extremely dangerous situation. It is a LOT of work to do it right, but you will be glad to did when you are done. I like your website Sir! Looking forward to watching your progress on the G-3. Chris, I agree with Dr. Frankenmerc on the floor/stringers issue. "bow" to that transom when you get to that point. Like I said before, My transom definitely needs to be replaced. It appears that in order to replace the transom, I will need to remove the deck. Is it held on by the rub rail? As per the floor and stringers, I think the next thing to do is expand the areas where I removed the rot to the centers of the nearby stringers. This will enable me to inspect more of the stringers and decide whether I need to remove the whole floor and possibly the stringers, or confirm that the stringers are ok and patch the floor. Does anyone have any extra parts? I need emblems, steering wheel, and maybe some trim pieces. Can anyone confirm that my seat is original? That IS NOT the original seat sir!!!! Thanks Jim! Are the brackets in the floor original? I spent some more time inspecting and taking pictures of the boat yesterday. I have updated the webpage http://fattiretrading.com/g3.html with new photos. Two or three of the stringers ( I want to call them joists) under the front deck have completely rotted away. Were the outer deck stringers originally double, or did someone sister new ones in later? WOW Chris,.....you definitely have your work cut out for you Sir! 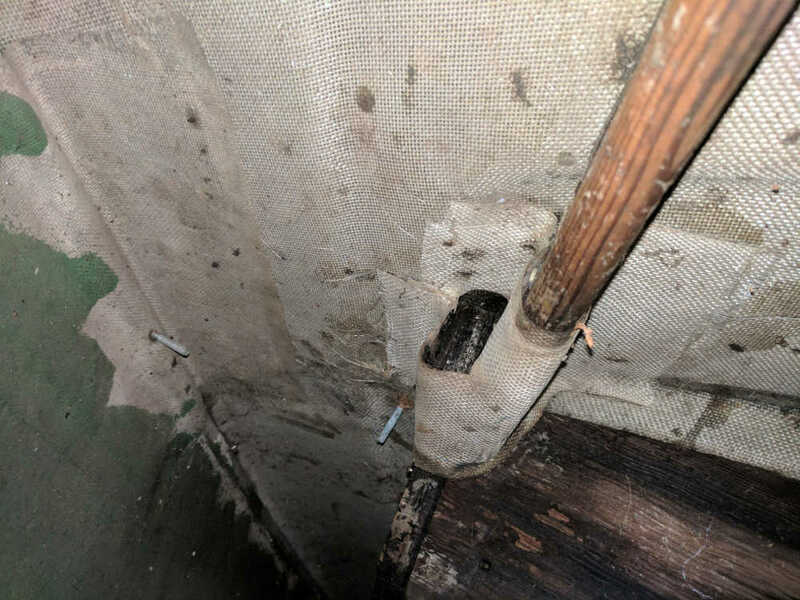 As Jim said, no, that is NOT the original seat and it looks like the prior owners tried to re-fiberglass under the front deck but did not use any fiberglass resin to make the cloth adhere to the old surface! However, those seat brackets fiberglassed into the floor DO LOOK ORIGINAL! Chris, those deck stringers or "joists" also do NOT look original to me. 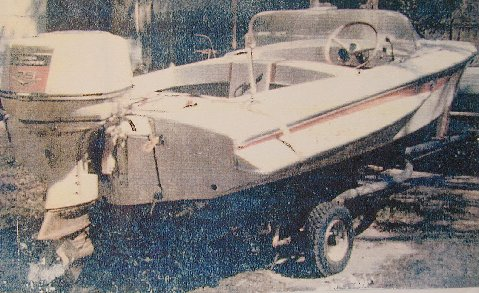 On our 1960 G-3 Glasspar put fiberglass tape AND resin over our deck stringers then painted over that with the original gray "Zolatone" Interior Paint that they used on most all of their boats. I will try to get a picture of here for you so you can see what I mean. Also, I noticed on the transom that it appears they have "through bolted" a piece of wood to hold the motor on. But you will have to redo that transom anyway. Now that I am further into assessing what this boat needs, I beginning to think that its not a worthwhile project. Dang Chris,....I am sorry to hear that Sir! I was getting some info together for you on where to get your G-3 Emblems, steering wheel, outboard motor and other parts. Please come back if decide to look for another G-3. I promise you there are many out there in very good shape. Welcom Chris, and congratulations on your find. Don't be disheartened yet. From your photos it appears the original fiberglass shell (from the mold) is in very usable condition and worth restoring. Any G3 is worth saving if it can be done, thay are a remarkable little boat and you will love it when finished. Bonus: it is a centredeck. So, separate the top (drill out rivets in rubrail, rail will stay with the top). The worst part is removing all previous bad workmanship, a bit dusty (wear a mask) and then do it properly. Not difficult if you do a bit of research and pay attention to detail. Time consuming but rewarding. 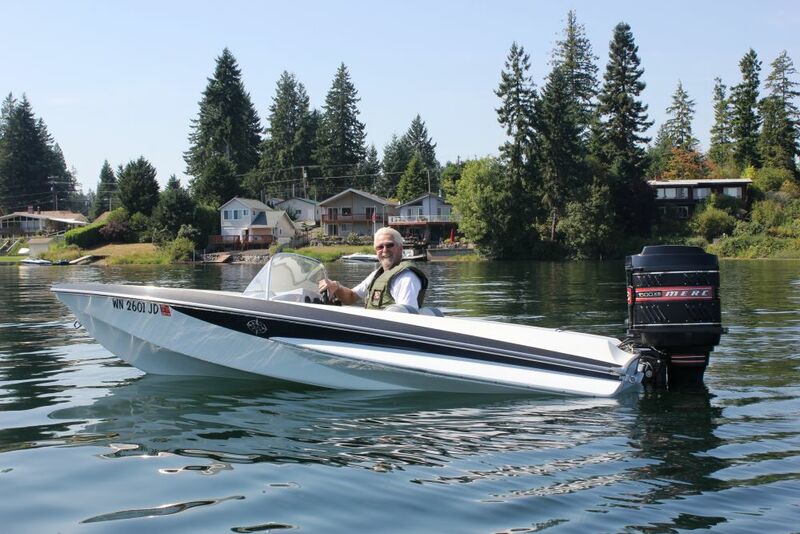 You should consider making it a 20" transom at the same time, bigger choice of motors..
Checkout the old forum on this site where you will find just about anything you need to know. Drop-down menu under 'forums' > Forum archives > G3 Owners Assoc. Many here will give advice if you encounter a particular problem. I want to add my two cents to the discussion as to the worthiness of the project. I restored a 1960 center deck four years ago that was in worse shape than your. I had no experience with fiberglass or with taking a boat apart. The only downside for me aside (aside from the hard work) was that I damaged the original port side rub rail and had to replace it with something more modern. The upside is that I learned a lot about boat building, using fiberglass, the importance of good friends, and what the term "craftsman" is all about. And, while the work isn't perfect, the boat turned out beautifully resulting in many envious compliments. It was rewarding enough that I would do it again if the opportunity presented itself. And, believe me when I say, there are few things as exhilarating as punching the throttle on a 13 and a half foot rocket! I would be happy to share some of my experience and ideas on how to do things if you're interest. Send me a friend request on Facebook and we can connect thru private messaging. Here's a few before and afters of my project. Would you like another G-3 ? I always envied yours and I know if you take it you'll restore it. Look on the G-3 forum. It's free to anyone who will restore it. Wow! What an offer! I might take you up on it, but I have to wait for some Dr. visits before I can say. In the last month, it appears I have been afflicted with rheumatoid arthritis to the point where it is difficult to use my arms and hands for even light work. I'm scheduled to see a rheumatologist a week from tomorrow to see what's going on with my body. In my current state, it would be impossible for me to crawl around the interior to the degree required by a full-blown restoration. If I may, I will stay in touch and we'll see how things turn out. I'm in the same boat (pun intended). Too little money and too much pain. I really want her to find a good home so if no-one else steps up before I have to move in the spring I'll still have her if you still want her. I hear good things about glucosamine sulphate from a couple buddies who take it for that. Might be worth a shot ? I hope the news is good. Have a great night.